Salt and pepper shakers don't get any cuter than this. So, add the Disney Mickey Mouse and Minnie Mouse Salt and Pepper Shaker Set to your table! 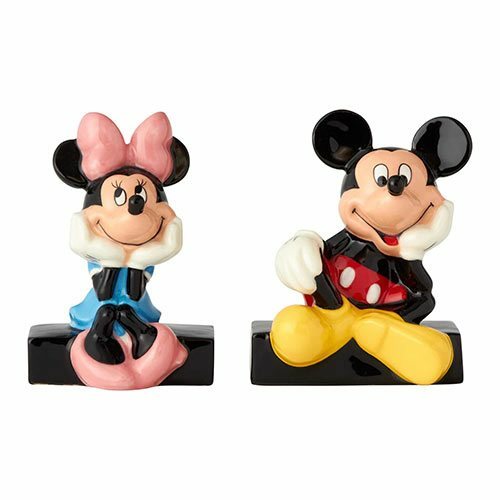 Handcrafted and hand painted to precision, the 3 3/4-inch tall ceramic designs capture the everlasting magic of Mickey and Minnie Mouse. This iconic pair's bubbly personas will shake a little life into any meal! Functionality meets style with Enesco's ceramic collection offering a variety of durable, usable giftware featuring beloved characters.